In India, the retreat of glaciers is causing water shortages for many villagers. Photo source: Wikimedia Commons. Hundreds of millions of people rely on glaciers as natural water reservoirs which collect and store precipitation in the winter, and provide water as they melt in summer. This is especially the case in the Himalayas, where glaciers feed rivers such as the Ganges in India and the Yangtze in China. In both cases, over 300 million people rely on the water that flows down these rivers for washing, drinking, agriculture and power. Many villages in the Indian highlands are facing water shortages as small low altitude valley glaciers retreat, or in some cases, melt altogether, leaving villagers unable to grow the staple crops they rely on to live. In the Ladakh region in India, 70% of water is sourced from melting glaciers. Meteorological data has shown that winters in the region are warming, snowfall is declining, and summer temperatures are increasing. However, a retired civil engineer is fighting back against the water shortages. Chewang Norphel has been harnessing the abundance of water as snow and ice melts, and constructing artificial glaciers to use when water is scarce. Norphel was inspired by the practice of leaving taps running overnight to prevent water pipes from freezing. He created the first artificial glacier in 1987 in Phuktse Phu village. Each glacier costs upwards of $5000 US dollars, and the availability of money has proved to be a problem for Norphel. Other challenges he has faced is a lack of interest in building glaciers from villagers receiving subsidized food from the government, and issues around accessibility and transport costs as the glaciers are constructed at altitude of around 4,600 meters above sea level. However, the process is far easier and cheaper than constructing a water reservoir, and uses as many local materials as possible. Freezing the water in winter also gets around the challenge of evaporation that a water reservoir would face. How are artificial glaciers constructed? At the start of winter (November), melt water from higher altitude glaciers is diverted at low velocities using constructed channels into ponds. These are located on shaded mountainsides where the water will freeze. This process continues throughout the winter months. So far, many of these artificial glaciers have been constructed, with the melt water from them in spring used to irrigate vegetable, barley and wheat. Unfortunately, once the large feeding glaciers are gone, there will be no melt water to use to construct artificial glaciers. But for now, these constructions are sustaining life for many people in the Ladakh region. IPS News, Creating Artificial Glaciers is Simple, Easy and Replicable. 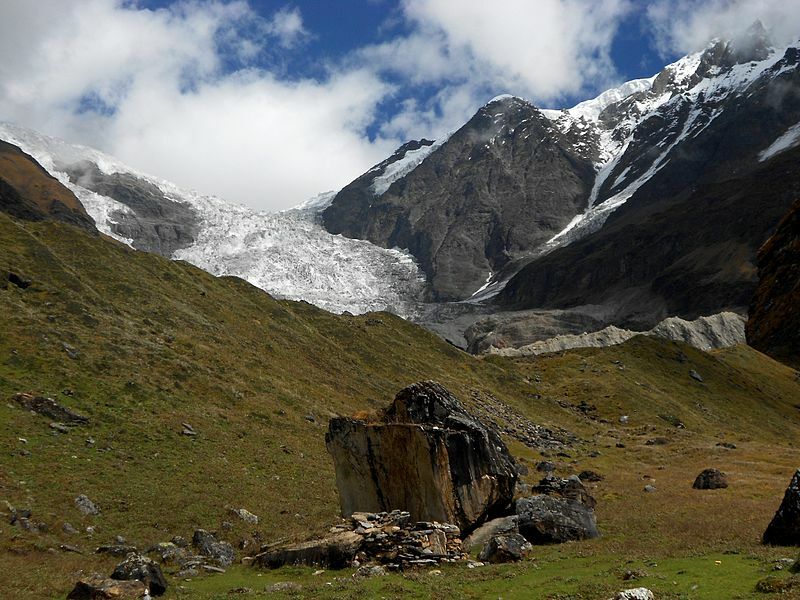 IPS News, ‘Glacier Man Vows to Build More Artificial Glaciers.